After all the rich holiday food, meals in January tend to be less rich. What could be a more perfect dinner than fresh tuna served nicoise style? The tuna was a gift and what great tuna it was -- lightly seared on both sides, the inside meltingly tender. It's a classic recipe and shouldn't be tampered with but finding myself without any harricot vert I substituted the last bit of asparagus in the fridge. We certainly didn't miss the green beans for the asparagus went well with the tuna and other vegetables. Tomatoes are usually a part of a nicoise platter but in the winter we don't buy store tomatoes (except plum tomatoes to roast) but we didn't miss them -- I fixed an extra egg instead! Husband Jim doesn't like olives so I didn't put any on my plate either. 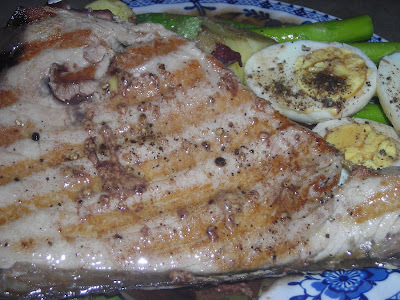 The best recipe for tuna nicoise that I've found is the one from The Barefoot Contessa -- it's easy and oh, so good! Here is her recipe, fixed my way! To grill the tuna, get a charcoal or stove-top cast iron grill very hot. Brush the fish with olive oil, and sprinkle with salt and pepper. Grill each side for only 1 1/2 to 2 minutes. The center should be raw, like sushi, or the tuna will be tough and dry. 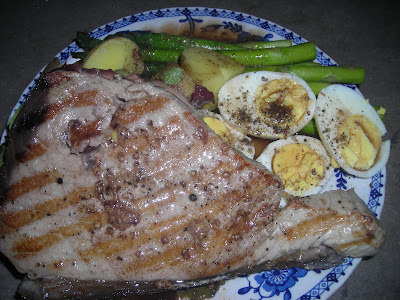 Arrange the tuna,asparagus, potato salad, eggs, and mixed baby greens on a large flat platter. You are so right. This looks like the perfect menu for January!